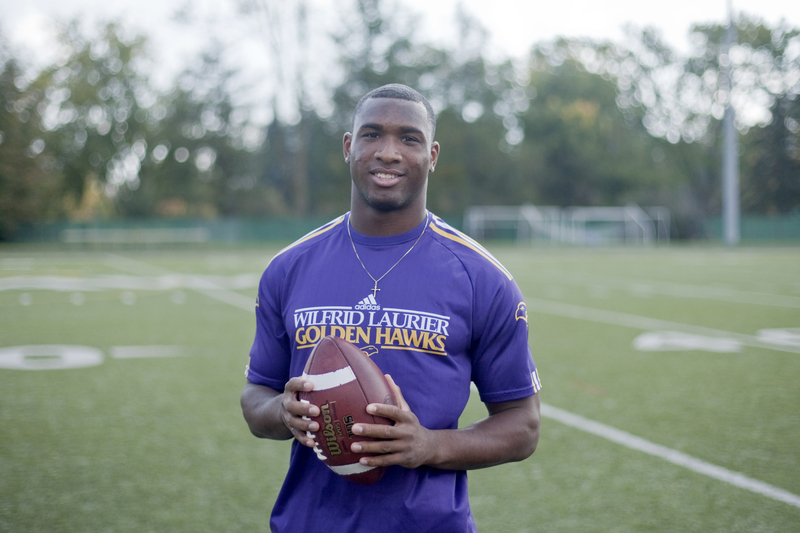 Wilfrid Laurier’s men’s football team may be in the offseason, but that doesn’t mean Dillon Campbell isn’t thinking ahead already. The third-year running back had a breakout year with the Hawks, posting record numbers and finishing his season currently leading the Ontario University Athletics (OUA) in rushing yards with 867 and one week to go. But Campbell didn’t have an easy road to his impressive performance in 2013. 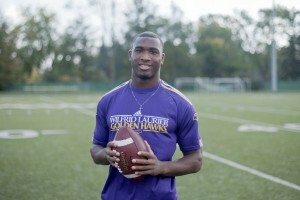 The Whitby, Ont., native came to Laurier — his number one choice — in 2011, joining deep into the football depth chart. Campbell suffered a torn lateral meniscus in his left knee on the second day of training camp in second year, only to fight through the pain, playing six games, and having surgery in the offseason. “That was a little setback, and I guess I never got back to where I was pre-injury. I was never playing to my full capacity in second year,” Campbell said. But that didn’t stop the third-year kinesiology and physical education student from being a starter in his third year. Campbell spent the rest of his second year and his summer getting ready for a big transition coming to the football program. That transition included a new playbook, a new no-huddle offence and a whole new system implemented by new hire, Michael Faulds. Campbell has a lot of praise for the new, young head coach of the Golden Hawks. That “better” the humble running back mentioned could be attributed to his 100-yard rush for a touchdown against the top-seeded team in the OUA, and currently the No. 1 nationally ranked Western Mustangs on Sept. 21. Campbell finished the game against the powerhouse Mustangs with 155 rushing yards and two touchdowns. Campbell made it look easy. And he made the rest of the season easy, recording over 100 yards in five consecutive games of his eight-game season. Against Waterloo, Campbell was 20 yards short of 200 yards, and two touchdowns. A lot of his success he attributed throughout the year to his young offensive line, which allowed gaps and held their opponent’s defence from catching the running back, notoriously known for flying down the sidelines. He also said that he likes the no-huddle offence. “Sometimes waiting for the play call slowed down the tempo, but otherwise the defence was always on their toes gasping for air. And I personally liked it,” he laughed. And it worked better for Laurier’s offence. With a long offseason ahead of the Hawks, Campbell doesn’t fret. He sees a lot of brightness in the future of the young squad — something he hopes to help with in his fourth year. “As a team, we need to keep getting better,” he said. “As you saw in the season, we started off pretty low, but each week we kept getting better and better and better. Now that the season’s over, we can’t let that plateau. Going into next season, a lot of our first-year guys will have experience now that they’ve played.